Don’t want to party all night? And too late to book a homestay/hotel? Carpe Diem buddy! Release some stress this weekend by planning for a getaway to any of these awe inspiring places for you to camp near Bangalore. Even if you aren’t a native or a resident of the city, this is your chance to make Bangalore your base this coming weekend. So pack your rucksack, put in the tent, and go camping. If you are an adventurous soul, with some inclination towards the enchanting aesthetics of nature, then Manchinbele should be your go-to weekend destination. You don’t even need to catch a flight. You can just drive or ride about 45 minutes out of town for this! Suitable for both water and land activities, at Manchinbele, camping and adventure go hand in hand. Surfing, sailing, kayaking, trekking, and much more await enthusiasts like you at this scenic destination, which is at a stone’s throw distance from the city centre and is an ideal choice for a one day trip from Bangalore. After a soothing drive of 4 and a half hours from Bangalore, if a picturesque view of the Nilgiris overlooking a thick green vault of flora and fauna welcomes you, all the worldly tensions vanish in the air. While planning a trip to Kalhatty, make sure you carry your camping essentials along. After that, all you need to do is just pitch your camping tent, and watch the beauty of nature’s elements unfold gracefully right in front of your eyes. This one could be a lesser known delight for some, but a camping sojourn at Bananthi Betta can literally induce vitality into those worked up nerves of the brain. This little hamlet is for those who are seeking some solace from the humdrums of city life and wish to spend some time close to the warmth of Mother Nature. There are other trekking and hiking options in and around Bangalore which include the mainstreams as well as offbeat places like the Bananthi Betta itself. The Votecad Nature Camp is a blissful hive close to nature, with dollops of fun and adventure elements that make it one of the best weekend getaways from Bangalore. Try it! It is one of the most picturesque sites around Bangalore, embellished with dense forests, small rivulets and coffee estates. Woah, doesn’t that sound refreshing? 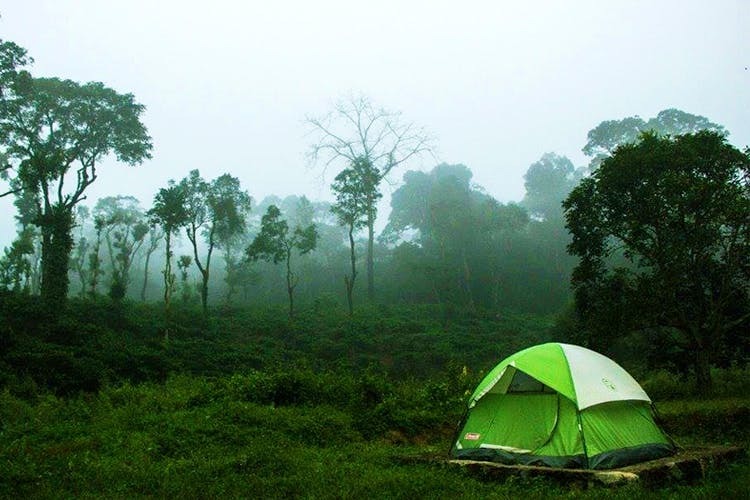 Coorg is definitely one of the most popular camping destinations in the region and there are many spots for you to pitch your tent here. The best part is that you won’t have to sweat the details too much, as the likes of Thrillophilia and Life Is Outside offer camping packages. Thrillophilia offers a whirlwind tour of Coorg; through coffee plantations, historic spots, and hiking trails during the day. At night, you’ll be able to tuck into a barbeque feast, by a bonfire, before retiring to your tent. On the other hand, Life Is Outside skips on the trekking bit and offers a stay by the Civet Creek. It’s all about taking in the sights and the sounds of the forest and the plantations that surround it, and enjoying the escape to serenity here. At night, you’ll even be provided with a telescope to explore the starry sky. In case you are looking to rent tents and other camping gear, be sure to check out our recommendation here.